1) When students write something down, they process the information more efficiently. When children take notes via handwriting, they are able to extract the most poignant information being given, which helps them retain material. Our student workbooks position children for successful note-taking through fun, developmentally appropriate letter writing activities that promote the fine motor skills needed to become successful at handwriting. 2) When children can think and write at the same time, without worrying about the mechanics of writing, they also learn to express themselves. Children are more fluent communicators when they have the foundational handwriting skills they need to express themselves without getting stuck on mechanics. 3) Handwriting helps children focus. Manipulatives can also capture a child’s attention and help build vital fine motor skills in preparation for handwriting practice. Hands-on tools add a tactile and kinesthetic component to letter formation. Try our Wood Pieces Set for Capital Letters to focus your child on multisensory letter learning activities. Children build their way to letter literacy as they imitate the teacher with lines and curves. 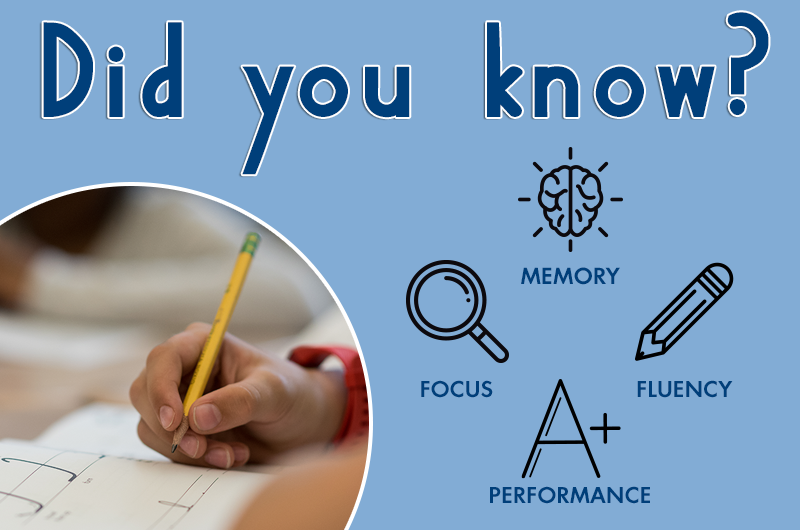 4) There is a positive correlation between better handwriting skills and increased academic performance in reading and writing. A study published in the Journal of Early Childhood Education and Development looked at 1,000 students when they were in Pre-K and then again in second grade. They found that Pre-K students with good fine motor skills—from handwriting instruction and practice—outperform their peers in both reading and math by second grade. Children need ample opportunities in the classroom to practice handwriting. For additional handwriting practice, our Building Writers student workbooks offer structured practice to build core writing skills with narrative, information, and opinion writing activities. Building Writers student workbooks allow children to practice both the handwriting and writing skills they need to succeed academically. Ready to learn more about teaching handwriting? Are your students struggling with reversing their letters and numbers? Help them turn their reversals around—line by line, curve by curve! Whether you’re new to Get Set for School® and Handwriting Without Tears® or you’d like a refresher, our upcoming webinar, Moving Forward Not Backwards with Reversals, will give you fun and effective strategies for your handwriting instruction.